Oh man guys HERE WE GO. Oh skarva you lovable fool I can not wait to see where this goes and all is forgivin with this comic! Take as much time as you need :3 the suspense makes it all the better! Lorelei’s healing hands don’t involve morphine in any way, do they? Morphine hands! Now THAT’S a special power! Aw… Skarva is just so happy, but–unless you’re planning something I’d never guess–I’m somewhat sad because of what I think his fate will be… It takes a REALLY good character to cause me to sympathize with them. I know. That smile melts my heart. He looks so happy, suddenly everything makes sense, suddenly everything is ok. He even faints happy. Oh yeah, that smile reminded me of the one in the page “Nothing could go wrong.” I have a feeling you didn’t plan it that way, but both of those smiles were in the bottom left panel, and both were (sort of) on each end of the love potion part of the story. Wow, that is a nice echo. I like doing stuff like that… I wish I could say I HAD planned it. Skarva needs a hug. A healing hug. From Lorelei. GO FORTH AND HUG, HEALER GIRL. Don’t worry, she’ll catch him! That’s not appropriate use of your healer, Skarvy. He never read Lorelei’s instruction manual. does “a wild little girl” comes with a tutorial too? Skarva’s other black eye got bored and left. Also, I think my feels are gonna be affected by whatever this new twist will bring. And captcha blesses us with another Mook name: Whildin Tryank. Maybe it’s where the comic caught me at a sort of bad time (nothing happened, I’m just…not in the best condition) but I feel so horrible for Skarva and I was tearing up by the last panel. Maybe I’m being cynical, but this doesn’t feel like a simple fainting spell…I don’t think he’s going to wake up and walk normally after this. I would love to see it! Really, that is super-exciting… our first fanfic If you don’t want to post it here in the comments, you can always email it to altermentality and/or abscondwithapie at gmail. I’ll e-mail it to you a little later, first I have to make sure that it’s PERFECT. ;v; It’s really short though, like two hundred words. 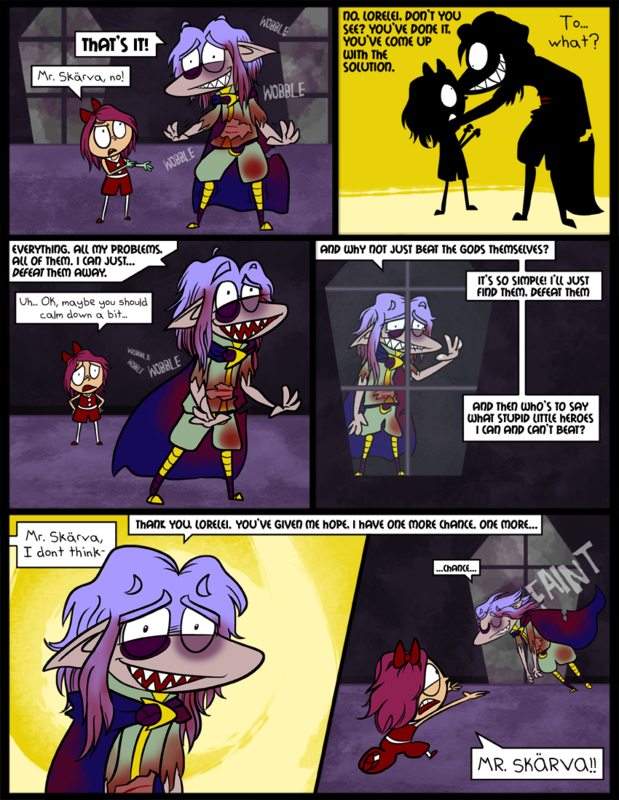 other than the fact that Skarva looks totally creepy in the second panel this is exciting. Skarvas gonna do crazy stuff! cant wait to see what the gods look like! Ah, nothing more refreshing than another ray of hope! Captcha: “ydhori LITTLE NECK”… Uh, what? Man, we are going to blast everyone with our hope rays of evil, evil, deity-defying hope. This may sound odd, but I really like the yellow backgrounds. I think it’s because I’m so used to the muted colours of the backgrounds in the last dozen strips, tapestries and things aside, it helps highlight how spun around his mind is right now. Nice. …I sound like such an uppity artsy loser. I feel dirty. Well cool, because that’s exactly what I was going for! I must be an artsy loser. But I knew that already. I also use the yellow/gold for light magic/the power of good, and therefore honest good intentions and pure enthusiasm. Which is so deliciously ironic with what Skarva is raving about right now. Muse on that a little bit if you’d like. and also “FAINT” ALL. THE. TIME. Skarva will probably be mproll slumbering for a while. Wobble is really a strange word, isn’t it? Yep yep! And you’ve been with us almost the whole time! Thank you. If Skarva’s rage produces orange, and his joy produces yellow, then what does anxiety produce? Also I think that Lorelei will be emotional scared after panel two. …Red? Red I think. Sadness is purple, or blue, then again blue is also his favorite color so that’s kind of his calm, I would guess. Orange is the complementary color of blue, its opposite, hence why it’s his rage. Wow I am just making this up on the spot but I like it. XD Still though, it really kind of varies according to what looks good with the rest of the page. The orange is the only really standardized one. Skarva can paint with all the colors of the wind! I have no idea why, but the fourth panel reminds me somewhat of part of “Jack’s Obsession” from Nightmare Before Christmas. In particular, after Jack has solved his dilemma, haha. Educate yourself! With historical inaccuracies! I mean, um, Idenau. yes. ah Skarva…should I lend him my armor? (noooo he deserves whats coming) will you shut up? Alter can’t wait to see how this comic progresses (but if the next comic is a title page I will slice you like a tomato) hahaha don’t mind him he’s just kidding, (no i’m not) shut up. First off I’m sorry I don’t know who you are. (I’m not sorry) dun mind him I am naturally half insane…no I’m not kidding. Anyways yes I am a bit of a strange character. (A bit?) quiet, but that’s what seperates me from the waves and waves of emotionless blobs ^_^(also prevents me from stabbing people with a sharpened sword) but yea ALSO raising 200 dollars to donate to this comic ^_^ Abscond doesn’t really want me too but I ain’t stopping. Skärva’s psychotic face makes meh happeh. whoa a new word my 3ds says is real EBERSWALDE. “alibedd university” Oh, boy, a new institute in Idenau! Nyooooooooo I got lazy and didn’t check for an update until now. Oh well, job well done once again. just realized something his cap is torn black has torn the cap skarva is not going to be happy once he stops being crazy. Is it just me, or does Lorelei’s legs look a little weird in the last panel? Also, who knew you make a faint sound effect when you faint. It’s kinda like POCKET DIG! Well I guess no one will be confused and think that Skaerva is trying to face plant in imaginary snow. well then that is a noble cause to miss an update. Congrats to her brother, though! blank is a lazy hero. he only has to punch his villain in the the eye once and he looks beat up… stupid blank. And now, my good friend captcha would like to say a few words *fumbles with mic* ahem… “Continuance, exaskin” thank you. Ice am snow happy to see someone else s-hail try the whole “defeat the gods” thing for once, it was getting cold doing this by my lonesome… soooo… my money says that skarva beats the crap outta you guys……sorry but it’s not n-ICE for me to lie to yah, were cool right? His window is shaped like a COFFIN. If that’s not a foreshadow I don’t know what is! Well, technically they come to a point at the top, but the way the panels are framed it DOES look like that. Between that and Lorelei’s nightmares, well… I guess you’ll just have to see what it all means, or if we were just trying to scare you! OH and I also noticed that Skarva’s face was only half healed because he pulled away soon! I love little details like that! Thanks! I love it when people catch them. Is this all a big setup so Skarva can use the “Where are your gods now?” line? Yup. That’s it. That’s the whole reason we’re making this comic. I can’t wait for the years of effort to pay off!